When Susan finds a photo of a little boy pushed through her letter box and the note on the back says it’s her son – the son she killed four years previously – she is determined to find out the truth about who sent her the picture and why. With the help of her best friend, Cassie, and a local journalist, Nick, she begins to dig deeper into what happened on the day she woke up and was told she had murdered her baby, a day she can’t remember. Slowly, she begins to unravel a web of lies, lies which put her and those around her in danger but lead her closer to uncovering the truth. 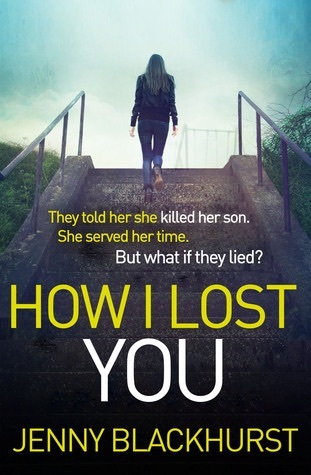 As you can probably tell from that brief summary, How I Lost You presents a tangled web with lots of twists, turns, and red herrings. It does get a bit confusing at times but I still found myself turning the pages to find out what happened next. It wasn’t what I expected and didn’t quite end up where I thought it would, which I liked. I also liked Susan and felt for her as her world, one that she had worked so hard to rebuild, started to fall apart again. Nick and Cassie I needed a bit more convincing of. Nick was a little too good to be true whilst I wanted to see and hear more from Cassie. She started off as a really strong character before fading into the background and becoming nothing more than a voice on the end of a phone. Despite this though the plot held together well with a slightly unbelievable but enjoyable ending making it all worthwhile. It’s especially impressive as it’s Jenny Blackhurst’s debut novel and I have to say I liked this book a lot – definitely a recommended read!